How a stay-at-home accountant caused one of the biggest upsets in world poker history. 2003 was the year that poker changed forever. And it was in no small part thanks to the incredible run that saw a 27-year old accountant take out the $2.5 million World Series of Poker title. Before 2003, poker was growing its presence online. But with Moneymaker, a virtual unknown in the poker world at the time, doing the unthinkable, the online poker boom was born. By anyone’s standard Chris Moneymaker was no poker prodigy – although his surname might have you believe otherwise. Moneymaker’s family were of German descent and they had a family history of making gold and silver coins. They changed their name from Nurmacher when they moved to the US to make it easier to pronounce. When he was younger, Moneymaker was good with numbers and loved playing cards. He grew up playing Bridge with his grandmother and Blackjack with his father. By all standards, he led a ‘normal’ life. He went to college and completed an accounting degree before getting married, moving to the suburbs and working full time as an accountant. Around this time he started getting interested in poker. He began playing regularly with friends around his local area before opening an account online with PokerStars. Moneymaker had been playing online for a little while, however, he never really had more than a few hundred dollars in his account. At the time of his big run, he even had to cash out some money to pay off some bills. Moneymaker entered a Satellite tournament, that is now known as the start of his journey. Ironically, he didn’t even realise that he was joining a tournament that could see him make it to the WSOP at the time. It was a $39 ‘sit and go’, which he eventually won, putting him into a tournament where the top three would earn a seat at the 2003 WSOP. The qualifier for the WSOP had a payout structure where the top three would get a seat at the main event. However, fourth place was paying out $8000. At the time Moneymaker was broke, so he went into the tournament looking to take out fourth spot to collect the prize money. A friend convinced him to take a chance and try and win a seat, and offered to give him $5000 upfront in return for half his tournament winnings. In the end, he won a seat and made the journey to Las Vegas with his father in tow for moral support. Moneymaker had never set foot in a bricks and mortar casino and he was decidedly nervous about it. He didn’t expect much to come out of the experience but built confidence as the day progressed and started to build up a decent stack of chips. On the second day, he slept in and was worried that he might be disqualified. However, his blinds got blinded off until he arrived. Early on in the tournament, he didn’t take too much of a hit to his chips. He played with an aggressive style and was the chip leader at various points throughout the day’s play. As his stack grew, so did the attention that he was getting. He started getting interviewed by the media as everyone was interested to know how this no name was giving the world’s best a real run. His good run continued and Moneymaker made it all the way to the final table where he ultimately powered his way into the final two. He faced Sammy Farha – a well-established pro – for the title. One particular hand defined his golden run, running a huge bluff on Farha. His aggressive play, which is in stark contrast to most amateurs, was the highlight of his run throughout the tournament. 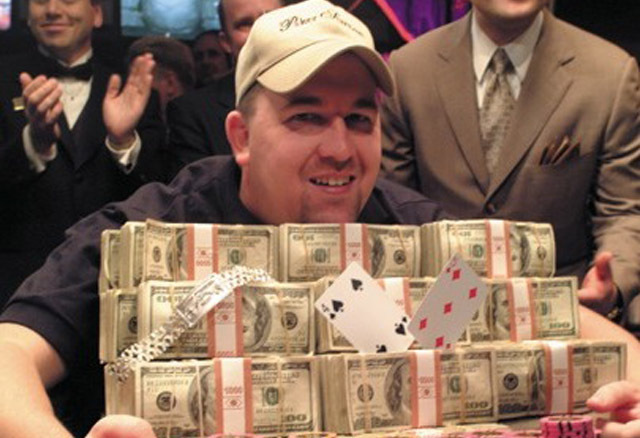 Moneymaker ultimately won the 2003 WSOP and pocketed the massive $2.5 million first prize. A relative unknown inspired a generation of new players looking to be the next WSOP champ. Critics of Moneymaker suggested he was the luckiest poker player in history. However, he went on to build a solid career as a pro, taking out a number of tournaments and cashing in some big games both live and online. Ever since his famous victory, poker has boomed and it’s due in no small part to this most unlikely of wins.